This work set out to be a direct response to the powerful and emotive images of boats, sea and people. These images saturated the media in 2016, presenting us at a distance with the desperation of families escaping war through the precarious passage of the sea. The images are cruelly compelling and primal. The fragile boats, over burdened with people, capitulate to the force of the ocean. They are crushed and overpowered and spilled of their contents. The sea is encountered as a last resort. One danger has been abandoned for the possible peril of the sea. This must be in the desperate hope to arrive at any place of safety. The shattering and scattering of human life in these pictures is hard to see and hard to ignore. I question the fortune of my own safety, of safe passage, of risk. 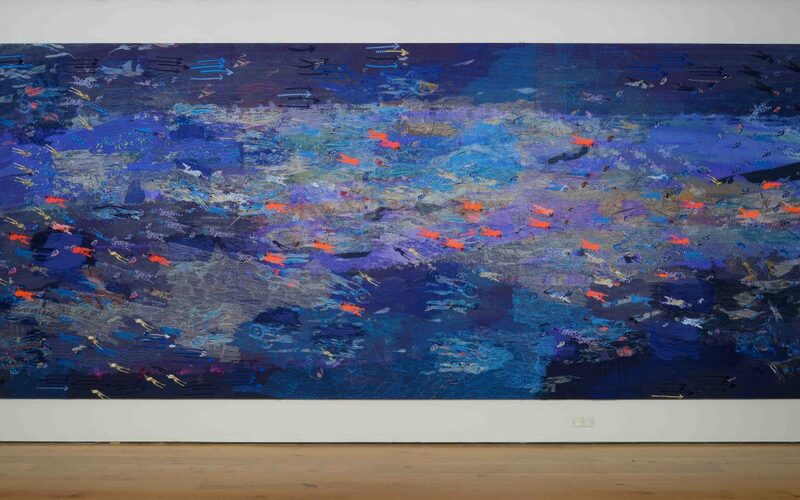 This work Sea commemorates the sea with its multiple mythologies, the lives and of hope. It has been troubling to make, it needs to be a homage and tribute to people I do not know. I do not want to be disingenuous or inappropriate. This starting piece bears witness to the refugee sea voyage. The stitched images are repeated. Thread has the capacity to bind, to draw, to make associations with histories and passages of patterns. In memorialising the voyages across the Mediterranean, this piece acknowledges each individual as part of a complex pattern of human disaster.